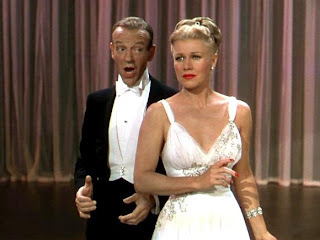 The last teaming of Fred Astaire and dance partner Ginger Rogers, The Barkleys Of Broadway is a light hearted musical with satisfying dance numbers, good humour, and plenty of style. Josh (Astaire) and Dinah (Rogers) Barkley are a married musical show business couple, very much in love but also constantly engaged in a bickering war. Their latest Broadway show, in collaboration with their friend Ezra Millar (Oscar Levant), is a huge hit. But when Dinah meets French theatrical author Jacques Pierre Barredout (Jacques François), he convinces her that musical comedy is beneath her, and that she is capable of becoming a leading dramatic actress. Barredout casts Dinah as his leading lady in a play about the young Sara Bernhardt, causing a split between Dinah and Josh. She struggles to adapt to the rigours of dramatic acting, while Ezra does his best to reconcile the once-happy couple. Astaire and Rogers had last appeared together in 1939, and Rogers was a last minute replacement for Judy Garland, who dropped out of The Barkleys Of Broadway due to ill health caused by prescription medication dependencies. Rogers stepped in admirably, and her tenth and final collaboration with Astaire allowed them to sign-off as a team in stylish colour. The movie is well paced by director Charles Walters, the song and dance numbers appearing at regular intervals, and enough of a romantic comedy plot and colourful characters to maintain interest in-between. In addition to several classic Astaire / Rogers dance numbers, Astaire gets an innovative sequence with a store-full of shoes that dance by themselves, an early example of well-executed special effects adding panache to an established genre. Oscar Levant, in addition to contributing most of the dry wit, adds further variety by performing two high-energy, crowd-pleasing piano pieces. The supporting cast also features Gale Robbins as Shirleen, Dinah's all-too-eager understudy, and a good source of humour throughout the movie. Astaire and Rogers deserved a successful conclusion to their screen partnership, and The Barkleys Of Broadway delivers the dancing goods.